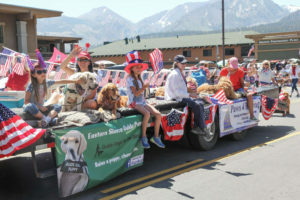 We’re just over two weeks away from the Chamber’s annual 4th of July Parade on Old Mammoth Road and Main Street. Float applications are due Friday. Save your spot to show off your business, organization or patriotic spirit. This year we’re giving an award to the best float in honor of Larry Johnston and his legacy of amazing floats over the years, so we encourage you to go all out! We’ll have barricades on Main Street this year for safety. But we need your help and cooperation — please do not cross the barricades, and remind others around you that being in the parade route is dangerous and not allowed. Spectators aren’t allowed to throw anything (including water guns/balloons) at the floats in the parade.